Hi everyone! I thought share with you as I have done on my You Tube channel about an herbal cleanse I’m experimenting with for my scalp. After all this is somewhat of a hair blog right? With this locking journey, I am discovering what my true hair texture is, what it really likes and so on. After my last retightening it dawned on me that I have an oily not dry scalp and dry porous hair. If you’ve been with me for awhile on this blog, you’ll remember me saying once the warm weather rolled around I was going to start rinsing my hair daily or at least every other day until it’s time to retighten. During those 4-6 days, I’ll spritz the locs. Well, I noticed that on day 5 sometimes day 4 of the retightening session, my scalp would start acting up as it’s done for as long as I can remember. By the time I get to the top of my head (I work from back to front) my trouble spots would be itchy, a bit sore and of course when I scratched, would flake. What really made me take notice was this last time when I scratched and the flakes fell they were oily! How can that be when I had stopped oiling my scalp 3 months prior? All these years I was thinking I had a dry scalp?! I was only making matters worse by adding more oil, washing my hair infrequently and when I did wash, it was with sulfate shampoos or too oily shampoos. Since I first put the braidlocks in, I started washing weekly but prior to that I was washing any where from every 2 weeks, stretching to 4 weeks as my hair grew longer and was more time consuming to maintain. Thanks to MzCJA, I was inspired to do some research on herbs and came up with an herbal cleanse for my scalp. Check out her blog for her posts on her herbal infusions. I’ve been playing around with it for about a month now adding some herbs, taking some out but I’m so far satisfied with the batch I made yesterday. I’ve been using it for the most part on my scalp and as part of the base for the shampoo for the locs themselves for the past month. I’ve been massaging it on my scalp every other day and rinsing it out. Slightly boil the aloe vera juice. While you are doing that put all of your herbs in a jar. Pour the hot aloe over the herbs, put your top on the jar and let them steep. I usually do mine for at least 2 hours and I like to use a jar with a lid on it since it seems to hold the heat in longer than in a coffee cup. All of these herbs have either astringent or emollient properties and some have both. Others have follicle stimulating properties. The result has been that my scalp feels cleansed but not stripped. I’ve been spraying the remainder on the locs since I’m now working out and they feel clean without being stripped as well. I’m still doing a weekly shampoo and I’ll do a another post at a later date after I’ve had time to observe how my locs react to this African Black Soap I just got as a giveaway. Disclaimer: All of the products mentioned in this post have been purchased by me. I have no affiliation with the producer/manufacturer or distributor of the product nor am I being paid to review the product. The opinions set forth in this post are solely my personal opinion. Today would have been my father’s 69th birthday today if he were still alive. Of course that makes him a Taurus. The planet Venus in astrology rules the signs of Taurus and Libra. One of the things that Venus governs or represents is creativity or artistic expression. I guess he is where I get a lot of my love of music, dance and creative/artistic aesthetic from. I posted this on You Tube Saturday as I was feeling a bit creative that evening. I was going to post it here Sunday when I saw that I had been tagged by Kumina (thanks again sis) you too Nat. As I’m about to condition my scalp with my coconut oil concoction, I though this is the perfect day to post this video on how I made a hair tie. My locs are 6 months old!!! The bottom pic is the from the day I finished putting the braidlocs in. Started out with 7-7 1/2 in of hair. My measurment tool for parting was a # 2 pencil. This goes for the horizontal partings and each individual section for the loc. Now, they are not all exact but I’m very happy with the results. I don’t know why I did not take a picture of the back and sides. The next 2 pics were taken 2 weeks later with 2 washings. I wash my hair every week & spritz everyday. My avatar pic is after my last retightening a couple of weeks ago. As you can see shrinkage is in full effect but they have filled out a lot. I’ll post a few more pics at the 1/2 year (6 month)mark which is coming up in two weeks. I promised in the intro post that I would come back to talk about why I chose braidlocks or as Cherie King spells it bradelocz. After wearing puffs and occasional afros I wanted to see for myself the merits of protective styling. I started out by wearing small two-strand twists for a week and then unraveling them for a twistout on the following Sunday. The twistout only seemed to look ok for 2 days max and then I’d two- strand twist again for another twistout on the following Sunday. That regimen lasted about 2 months. 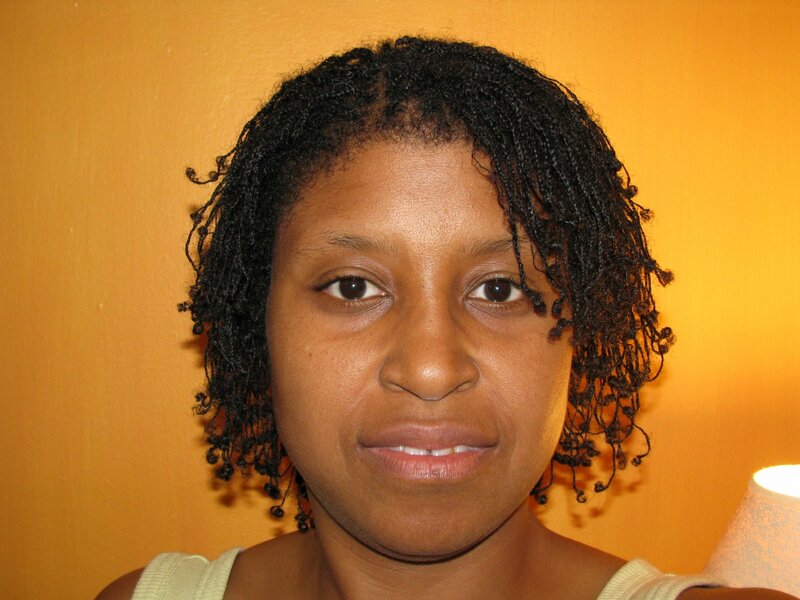 Then in January 2008, I ran across a challenge thread on nappturality.com, that called for keeping your hair in protective style, deep conditioning moisturizing, etc. on a regular basis. There were 4 quarters to the challenge and if I remember correctly 4 levels. The gold level meant you were in all 4 periods and doing everything required. I pledged level 4. 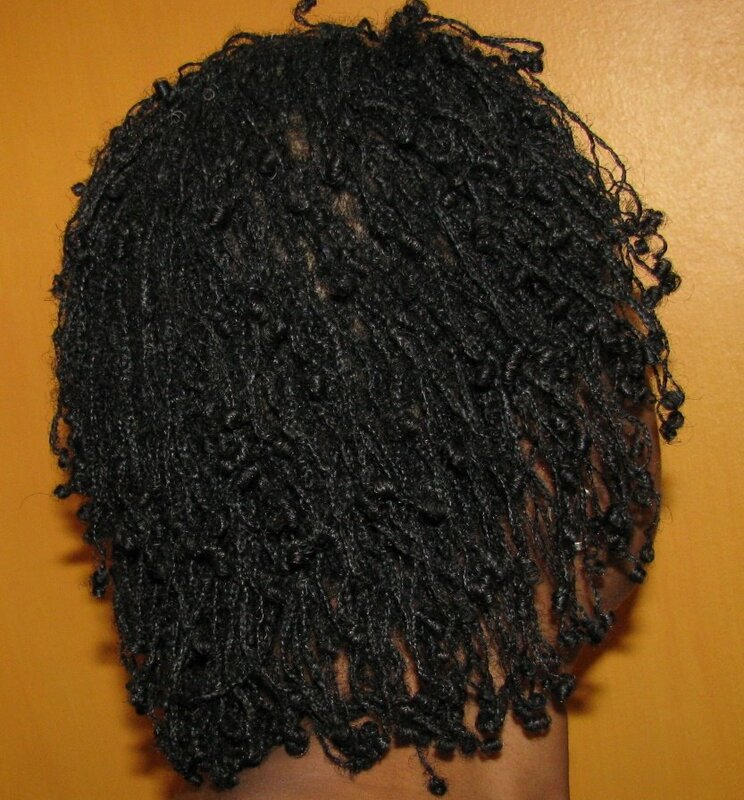 Now I’d been researching locs prior to entering the protective style challenge. Although I love all locs, I preferred the look of Sisterlocks. However, I did not have Sisterlocks money for the initial install, had absolutely no idea on how to maintain them myself and did not want to go back to being on someone else’s schedule in terms of doing my hair. Also, did I mention the money issue?! Gotta watch them pennies as they turn into dollars…I digress. Braidlocs seemed to be the answer and Cheleski’s blog was the answer to my questions. I could put them in myself, wash my hair immediately if I wanted, make them very small like the Sisterlocks, and I could maintain them myself. Yay!! But (you know there is always a but 🙂 ), I had no clue on what the latching method was and could not get a grasp on how to do it from the written instructions. (I’m a visual learner…coupled with written instructions). So I chickened out from putting them in when I originally planned which was sometime in late March or April. Fast forward to around mid June or so, I was looking at YouTube videos on locs and Nubianlockedprincess’ video pops up in the related videos section. The Universe answered my prayers again. You know the saying that when the student is ready the teacher will come? I have found this to be so true. She has a video that shows how to do interlocking (latching) which I watched over and over and over again. I had also asked many questions of naturalsoutherngrrl, ibbs72 and starlamotivates also on YouTube. Go and check their videos out as they are awesome women. Armed with all of the info I mined from all of these amazing women, I practiced sometime later on one of the two-strand twists and let it stay in to check how it would hold up through washings. My initial plan was to use the parting I already had with the two-strand twists. The tester loc looked great after 3 weeks or so but it looked like it was too large for my taste so I took it down. Wow!! It was a job just trying to get that one down, so that told me that it surely would hold up through weekly and maybe even daily washings/rinses. Confident with that information gathered from the test loc, the decision to loc was made. However, it was too darn hot to start this project as it was in the midst of summer and in the hottest months of the year. So the plan was to install the braids in late Oct/Nov time frame. Then suddenly a cold front hit the region the middle of August, making the weather feel like the beginning of spring and not the height of summer. I feel like it was the universe’s way of telling me “Now is the time”. That’s enough for now as I’m sure y’all are saying “Did she have to write a book? !” lol I told y’all I’m long-winded when it come to subjects I’m interested in. In the process of doing this post, I see that I may tie astrology and the other metaphysical sciences into my posts as my way of learning to know thyself.